RISALPUR: Defence services are a challenging and daunting job but our aim to join Pakistan Air Force (PAF) is to serve Pakistan, said Saba Khan, one of the four women general duty (GDP) pilots who are the first women to earn flying badges from PAF. Talking to reporters after the passing out parade at the PAF Academy, Khan, flanked by Nadia Gul, Mariam Khalil and Saira Batool, said that they were proud of joining PAF as cadets. They urged women to join air force “because it is an attractive and honourable service”. The four women pilots joined the PAF Academy in October 2002 and during three-year stay they had gone through demanding general service training. Two of them are from Quetta, one from Peshawar and one from Bahawalpur. 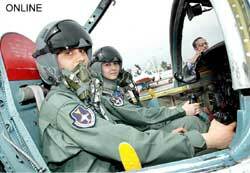 Air Commodore Abid Khawaja told reporters that the women pilots performed well in all fields during their training. He said although they faced some difficulties at the start of their training, they made rapid improvement to overcome all hurdles with hard work and dedication. He said they had gone through strenuous academic education and rigorous flying training on MFI-17 Super Mushshak and T-37 Jet aircraft. He added that three more women pilots were getting training at the PAF Academy under the 117th GD Course and would pass out within six months. Khawaja said the induction of women GD pilots had been stopped. “We want to check operational fitness of these women officers after which a decision about the induction of more women officers would be taken,” he said.